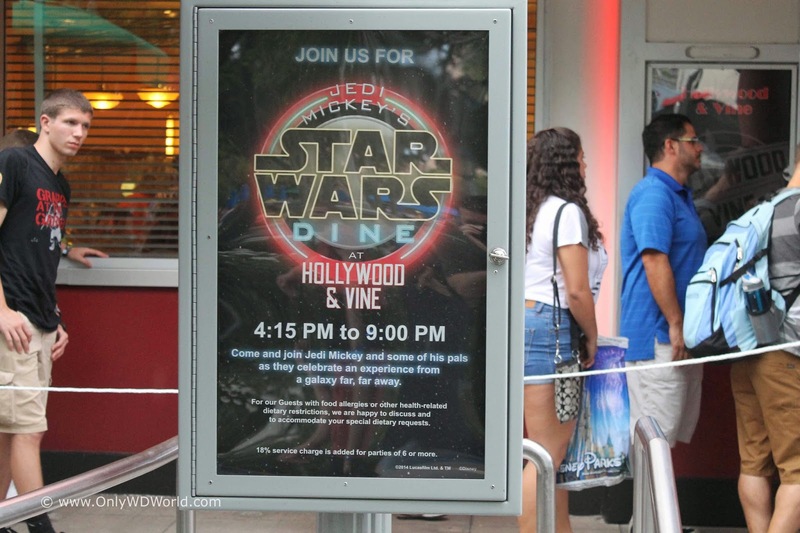 New this year at Disney's Star Wars Weekends is a special character dining event called Jedi Mickey's Star Wars Dine at Hollywood & Vine that occurs each evening from May 4 through June 15th, 2014. 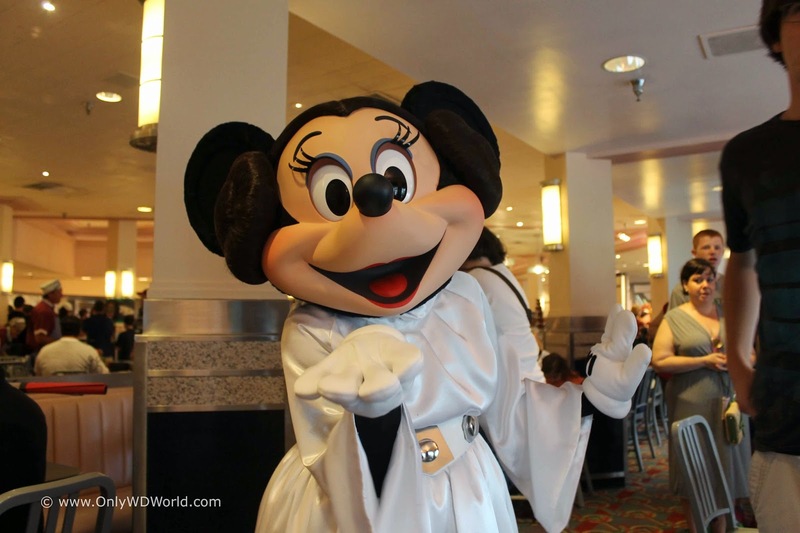 This special dining event combines Disney Characters dressed in their favorite Star Wars costumes and special Star Wars themed food set to delight any Star Wars fan. Reservations were required and hard to come by for this new addition to Star Wars Weekend for 2014. 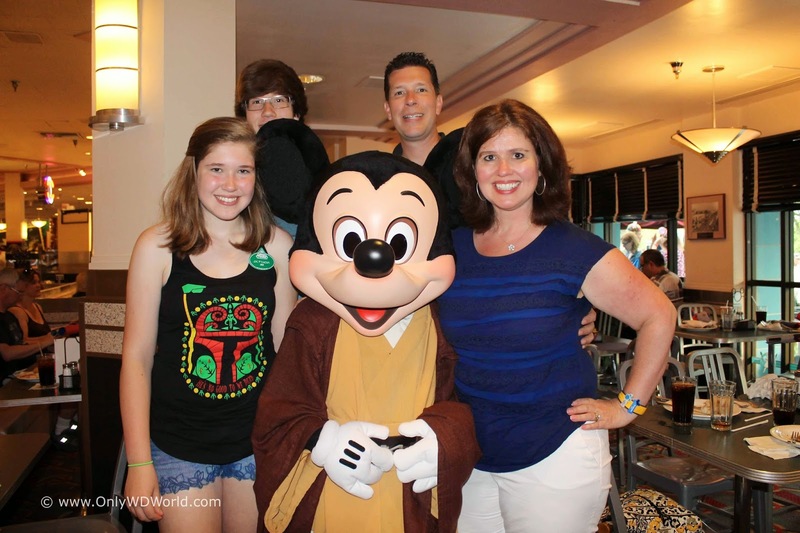 Like many other Star Wars fans we were excited to see our favorite Disney Characters: Mickey Mouse, Minnie Mouse, Donald Duck, & Chip 'n Dale dressed as classic Star Wars characters. By making this a Disney World Character Dinner it meant that you can see, greet, and take pictures with all of them in one dinner instead of waiting in lines multiple hours to meet each of them individually. Try the Stormtrooper Shrimp and Cocktail Sauce! 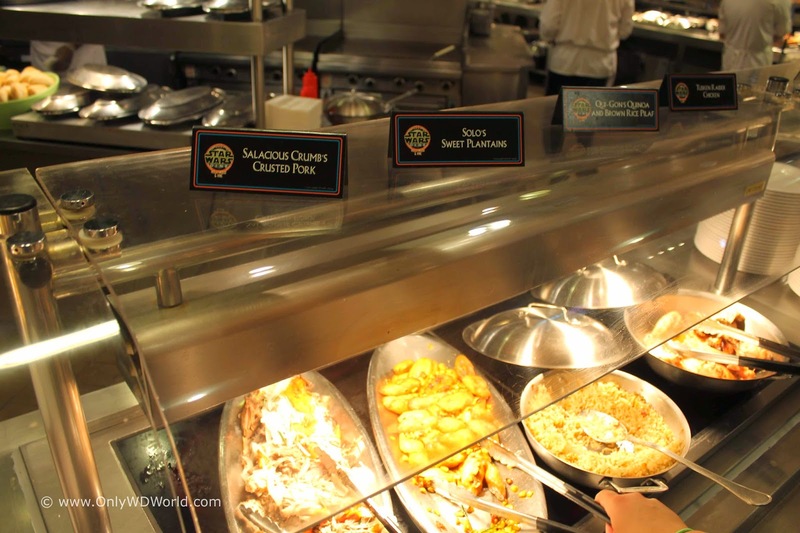 The buffet menu at Hollywood & Vine was also adjusted to make it different from the normal meals and put a Star Wars flair to all of the dishes. The biggest difference would be noticed at the Dessert Table. The dinner starts out by checking in outside the restaurant and waiting in line for the opportunity to take a group picture with Chip 'n Dale in their Ewok costumes. They had Disney Photopass photographers that took the complementary group photo and gave each family a special collectible Disney Photopass card. They would also take pictures on your personal camera as well. We then were ushered outside and again had to wait until our table was ready. Fortunately they were running close to on time and this secondary wait was less than 5 minutes and we were shown to our table. The inside of the restaurant only saw minor changes from its normal decor with the addition of a few Star Wars related banners around the columns and they handed out special 2-sided paper that could be rolled into "light sabers" supporting either the Dark Side or the Rebel Alliance. Like most Disney World Character meals the roaming characters (Mickey, Donald, Minnie, and Goofy) were spread out in the restaurant and made their way from table to table. Each family had to decide how close the next character was and then proceed to the buffet area to get food and then bring it back tot he table. 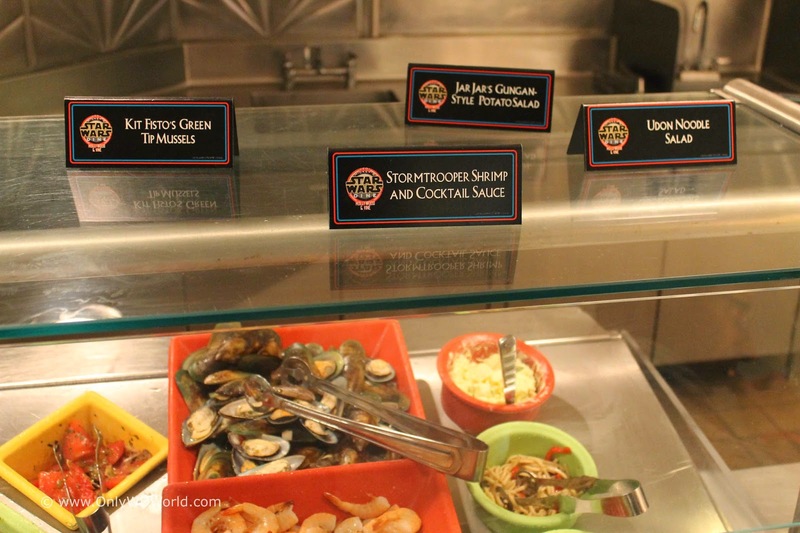 The entire buffet had foods renamed to make them appear more Star Wars friendly. Some our of favorite names were: Kit Fisto's Green Tipped Mussels, Jar Jar's Gungan Style Potato Salad, Luke's Chipotle Citrus Barbecue Chicken Thighwalkers, Lando's Lobster and Shrimp Macaroni & Cheese, Salacious Crumb's Crusted Pork, Qui-Gon's Quinoa, Skywalker Ranch Chicken, & Naboo Bean Cassoulet. Overall, the food was good, but not great. 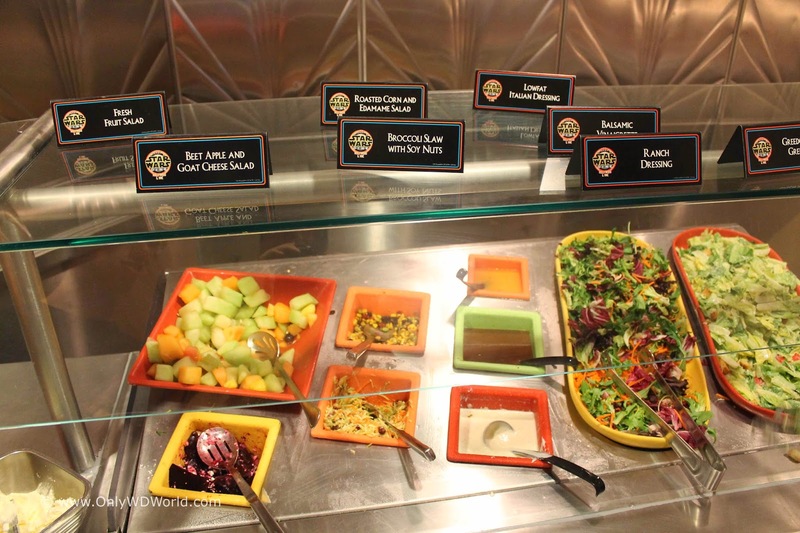 It was very typical of the buffets at Disney World. They were much better than a buffet you would find outside of Disney World, but they were not as good as many of the restaurants in Disney World that offered menu service. 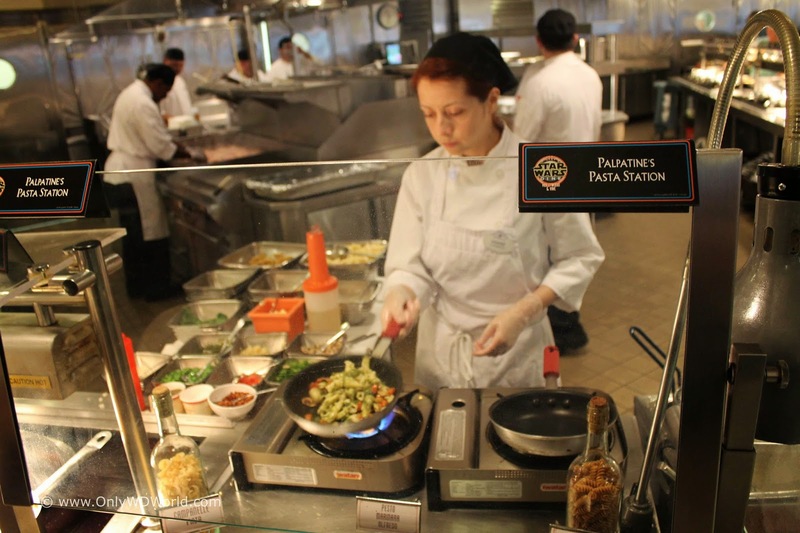 Palpatine's Pasta Station, which had a make to order Pasta Chef custom make each dish. Kessel Run Roasted Strip Loin from the Jedi Council Carving Station. 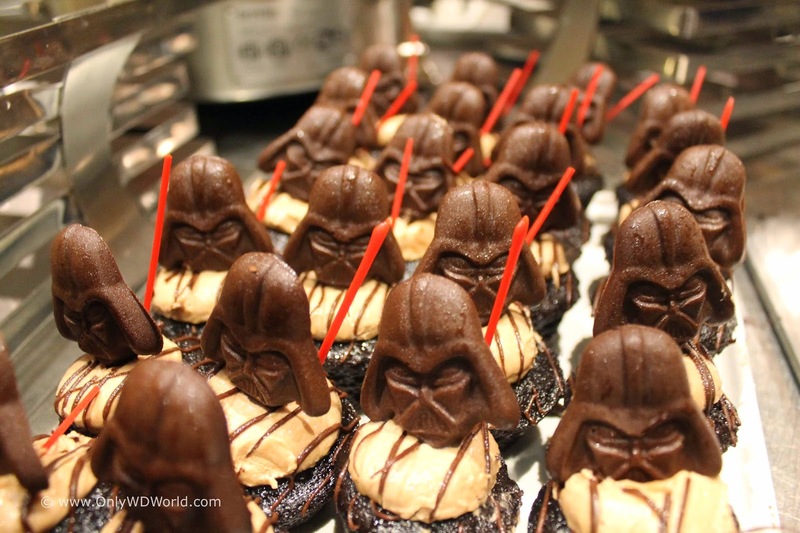 The dessert station was certainly most impressive! 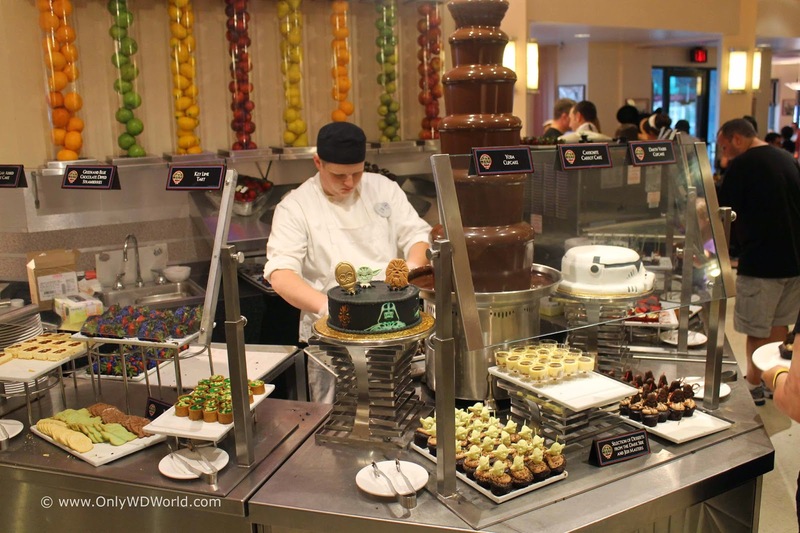 The towering chocolate fountain along with an assortment of Star Wars Themed desserts made for an excellent ending to the meal. 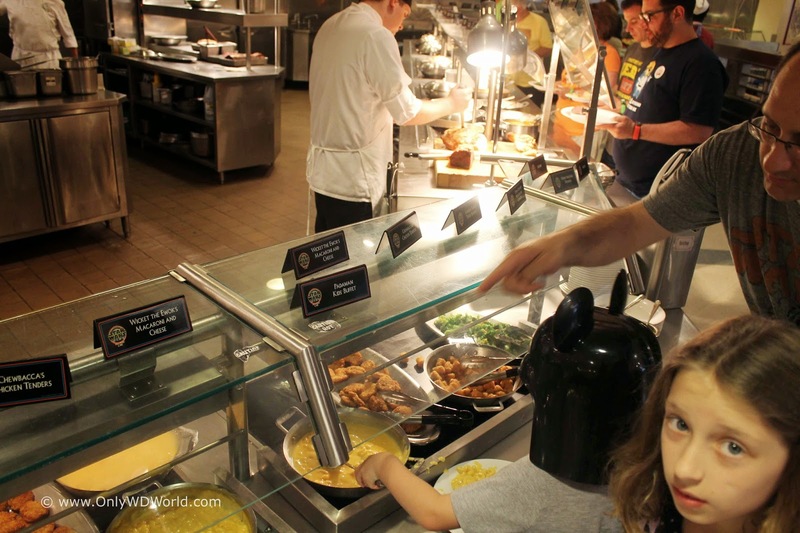 At the Walt Disney World Resort any of the character meals is made special by the interaction that yo receive from the characters themselves. 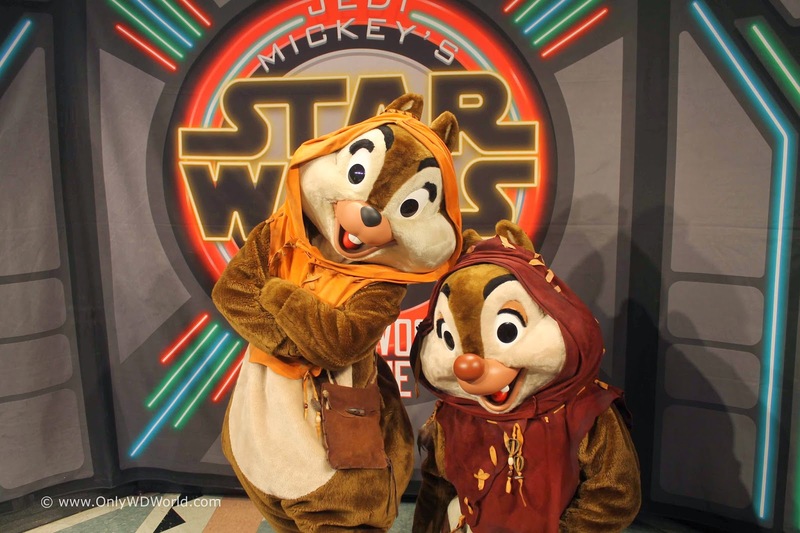 For this Star Wars Themed meal you had a chance to interact with Chip 'n Dale as you entered and four other classic Disney Characters during the meal. 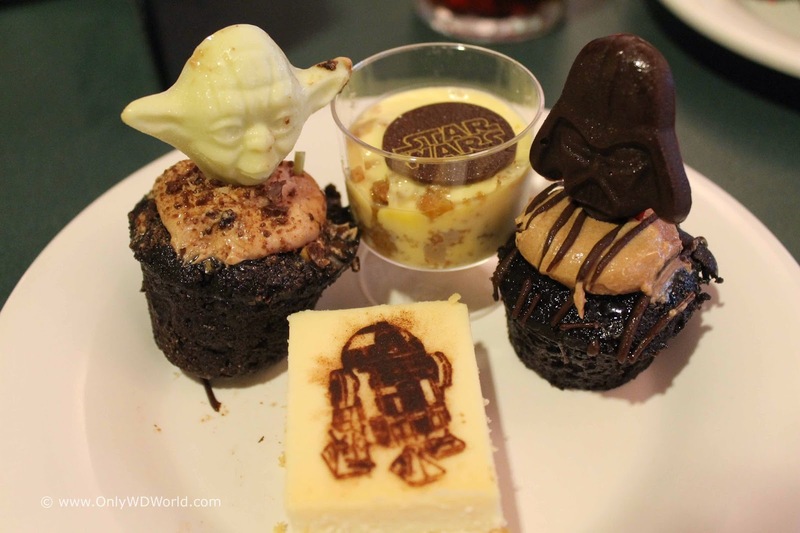 This most certainly bridged the gap between Star Wars and Disney and made for a very enjoyable meal! 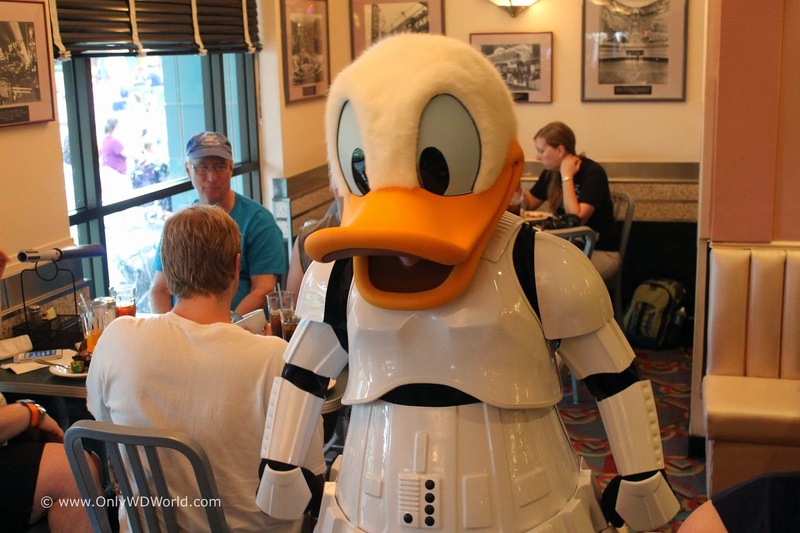 Donald Duck as a Stormtrooper makes for a wonderful picture. The white of the Stormtrooper outfit works well with Donald's colors. Not intimidating in the least, everyone wants to pose with Donald Duck for pictures. Mickey Mouse has no problem looking the part of a Jedi. 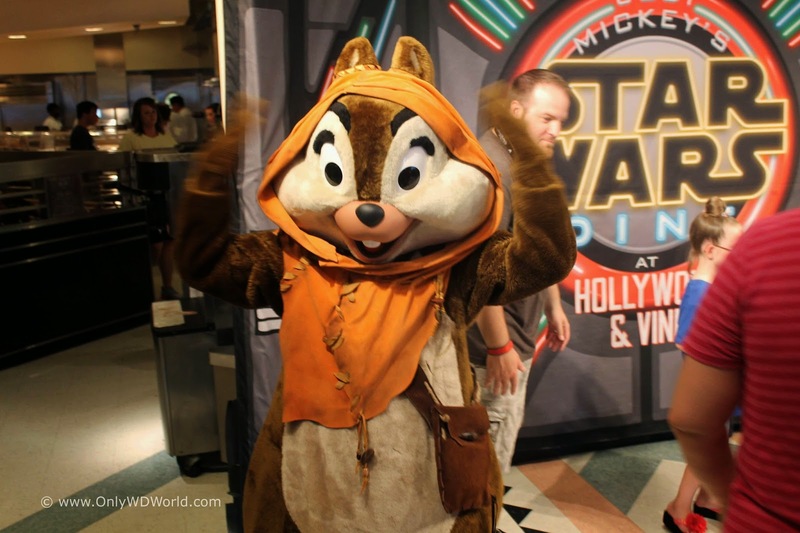 He certainly bridges the gap between classic Disney characters and Star Wars by simply donning a Jedi Robe. If only it was that easy for all of us to pull off the convincing Jedi look so easily. Goofy may not ever be serious, but he uses his height well to portrait Darth Vader. 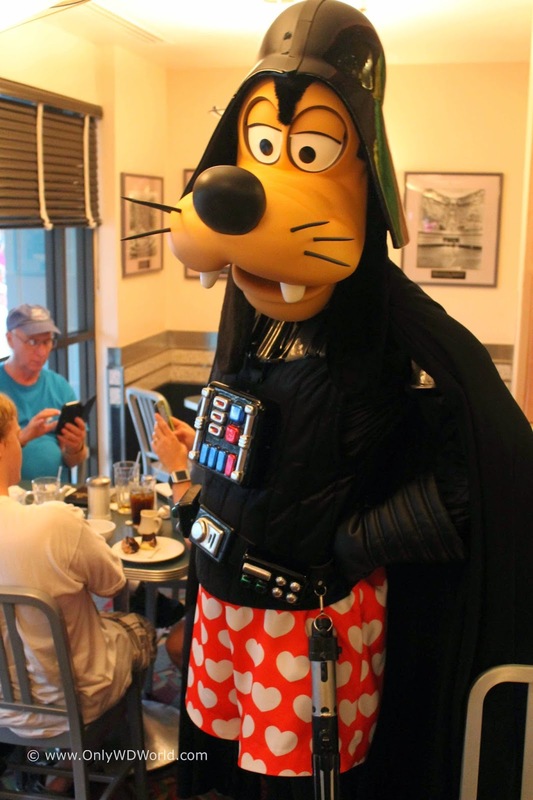 Although it may be hard to think of Goofy representing the dark side of the force, he certainly makes a family friendly character to grab a picture with. The meal did not come cheap. It was $55.99 adults and $33.99 kids 3-9, or two table service credits for those on the Disney Dining Plan. The event does not accept Tables in Wonderland; however, Disney Visa Cardholder discount of 10% off was honored. For Star Wars fans this certainly was a worthwhile event. You most definitely have to value the Disney/Star Wars character interactions or you most certainly did not get your money's worth. As mentioned earlier the food was good, but not great. 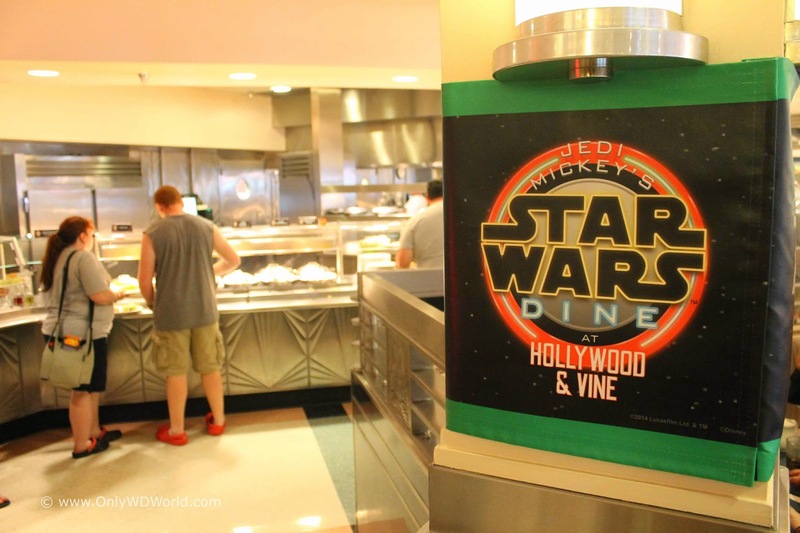 The value to this meal comes with the special Star Wars theming and seeing your favorite Disney Characters in Star Wars costumes and getting to interact, get autographs, and take pictures. 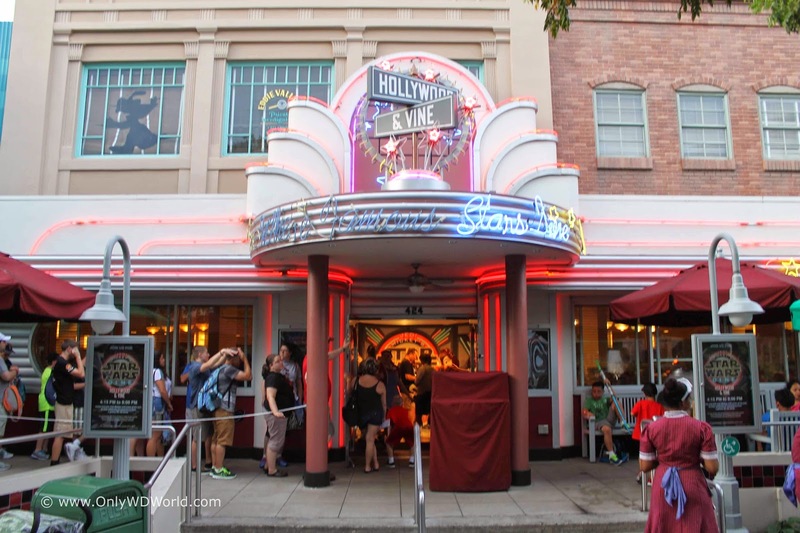 0 comments to "Jedi Mickey's Star Wars Dine At Hollywood & Vine Review "